We have an exceptionally LOW PRICE! Designed specifically for endurance horses. 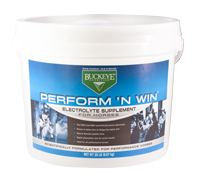 Perform n Win is rapidly absorbed, replacing needed minerals at appropriate levels for the performance horse while providing an energy source to maintain plasma glucose levels. FEEDING DIRECTIONS: General Directions: For each hour of work, mix one to three scoops (depending on intensity and stress of work), into one gallon of water. OR Special Event Directions: Preloading before an event : Mix three scoops in one gallon of water, one to two hours before the event. Immediately after the event : Mix three scoops in one gallon of water, for each hour of work completed. Guaranteed analysis per ounce: Sodium min 1,120 mg. Chloride min 2,600 mg. Potassium min 910 mg.